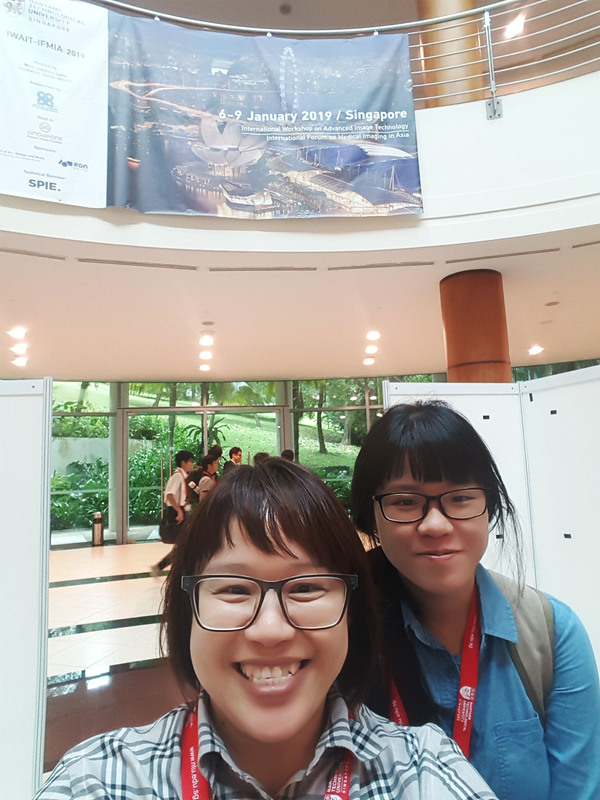 In an avenue with over 100 submitted research papers, the research titled “Fish Monitoring in Complex Environment” done by Faculty of Information and Communication Technology academic Assoc Prof Ts Dr Lau Phooi Yee and Bachelor of Computer Science (Hons) student Ling Yi Jun, stood out to be one of the best papers among 29 papers awarded. 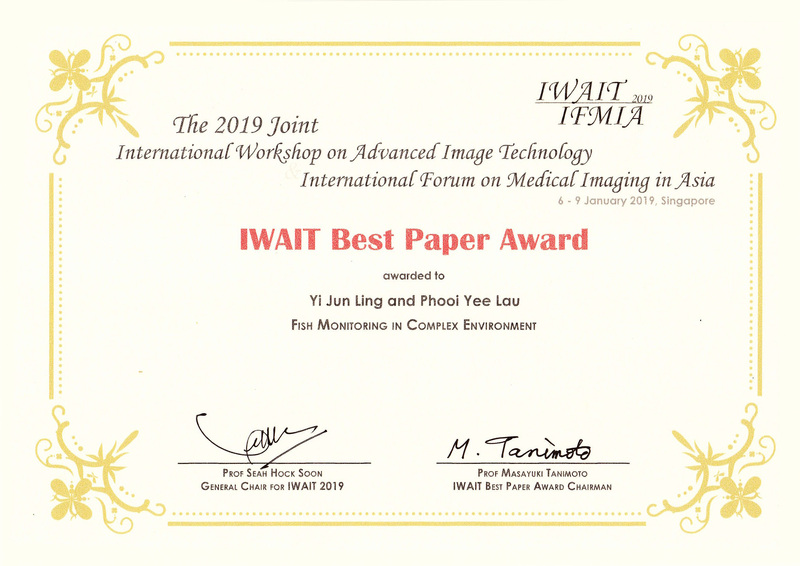 The researchers were awarded the “Best Paper Award” at The International Workshop on Advanced Image Technology and The International Forum on Medical Imaging in Asia (IWAIT-IFMIA) 2019, held from 6 to 9 January 2019 in Singapore. IWAIT-IFMIA 2019 aimed to provide an international platform for scientists, engineers, researchers and students to share and exchange research ideas in advanced image technology and medical imaging. “This award came as a surprise because it was evaluated based on technical evaluations, from at least two reviewers and two session-chairpersons. To be able to compete with hundreds of papers submitted and being selected as one of the best papers is definitely a joy and we are more than delighted. We spent six months to preparing this research and Yi Jun (Ling) spent a year prior into drafting and developing the system, working on the analysis and making improvements to the system,” said Dr Lau. Ling too shared the same excitement with Dr Lau and expressed her joy for receiving the award. “I am very happy to receive such recognition. I’m also equally grateful to my supervisor for all her guidance and for the opportunity given to me. The one-year worth of hard work has paid off,” enthused Ling. The research explained that aquaculture farm provides a solution towards the overfishing phenomena. However, maintaining big scale farms manually requires going through hours of video footages to collect important information about the fishes. These footages are usually taken by an underwater camera affixed in many different ways within the farm’s cage and are manually analysed by human operators. Since they are limited to biological restrictions, issues such as wandering attention span or human error may occur. This paper proposes a non-intrusive and automated way of extracting meaningful information such as the number of fishes from underwater and video footages of fishes using image processing techniques. Experimental results show that the system managed to achieve 74.59% accuracy for correctly counting fishes. “Working in this area for 12 years, I saw great potential in this field. Particularly in assisting the fish farm industry in reducing operational workload in monitoring their fishes, by automating the monitoring process. Therefore also reducing the cost of production and retail value, making farmed fish an affordable choice for consumers,” explained Dr Lau. Meanwhile, Ling mentioned that it was her interest in underwater image processing and the research’s possibilities of positively impacting the society that kept her motivated to complete the research. The research addresses the increasing concern of the over effects of fishing activities on the benthic ecosystems in all regions, where commercial fishing is practised, with the evidence that fishing gear may injure benthic organisms, reduce habitat complexities and reduce biodiversity. Dr Lau explained that with proper instrumentation, such as the use of underwater video imaging, it is increasingly becoming useful to assess the impact of human activities, including fishing in marine habitats. “In manual operations, highly trained marine scientists scan the video data for meaningful information such as salient or interesting objects. Due to the wide varieties of marine animals, with low contrast and complex marine structures, the processing is not easy and the results may also depend on the skill and concentration of the human operator. Therefore, with the application of automatic digital image processing techniques, proper procedures could be done while minimising uncertainties of results,” explained Dr Lau. While Dr Lau attributed their dedication, hard work and foresight as the winning factors for their award, Ling, on the other hand, added that one of winning factors was due to the novelty in the visual features used to detect the fishes. She also added that the framework created, showcased real practical usage with various test different footages displayed. The International Workshop on Advanced Image Technology (IWAIT) is a well-known international conference/event that gathers researchers, professors, students and interested persons in the field of advanced image technology. Previous IWAIT events have been held annually since 1998 in Eastern and South Eastern Asian countries. IWAIT 2019 is going to cover advanced topics of image/video and multimedia technologies. The topics include, but not limited to, 2D/3D Image/Video Processing; Pattern Recognition; Image/Video Compression; Video on Demand; Broadcasting; Networked Multimedia; Multimedia Systems; Big Data Image/Video Analysis; Multimedia Applications; Computer Vision; Medical Imaging & Applications; Virtual and Augmented Reality; Animation; Computer Graphics; Cloud Multimedia Computing; Social Multimedia; and AI and Machine Learning. The International Forum on Medical Imaging in Asia (IFMIA) is an international conference for scientists, engineers and clinicians in all Asian countries to exchange new ideas and the latest research outcomes in medical imaging. IFMIA was originally held as the Asian Forum on Medical Imaging at Cheju, Korea in 2007. Based on the success of the forum, the International Forum on Medical Imaging in Asia was launched in Taipei, Taiwan in 2009 (IFMIA 2009); followed by IFMIA 2011 at Okinawa, Japan; IFMIA 2012 at Daejeon, Korea; IFMIA 2015 at Tainan, Taiwan and IFMIA 2017 at Okinawa, Japan. The conference attracts leading scientists, engineers and clinicians in Asia from a wide range of disciplines associated with medical imaging. Topics of interest include, but are not limited to, Medical Imaging and Reconstruction Theory (CT, MR, X-ray, US, PET, SPECT, OCT, Biological image, Histological Image, etc. ); Medical Image Analysis (Segmentation, Registration, Feature extraction, etc. ); Computational Anatomy and Computational Physiology; Computer-aided Diagnosis; Computer-aided Surgery and Therapy (Medical robots, Surgical and Interventional Systems, etc); Radiogenomics / Radiomics - Visualization, Interactions, Virtual/Augmented Reality, and Simulations; Medical Informatics (PACS, IHE, Telemedicine, E-health, etc. ); and Deep Learning in Medical Imaging.